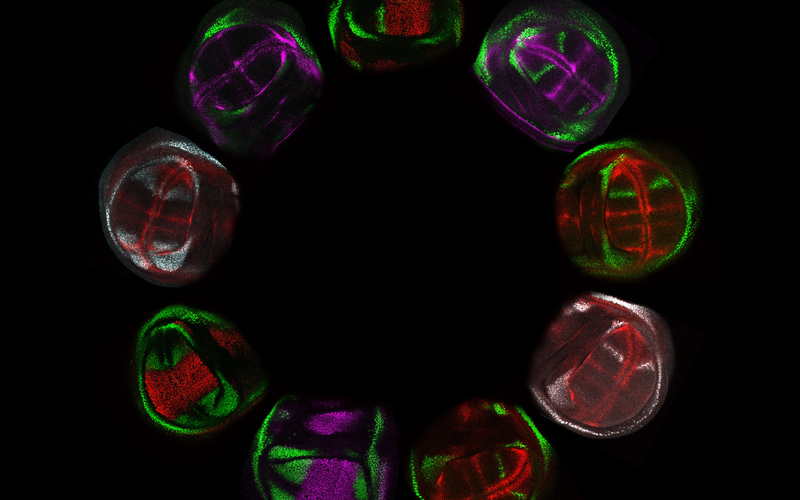 A necklace of early stage developing wings, each labeled fluorescently to reveal a different pattern of gene expression. In 2015, University of California San Diego biologists Ethan Bier and Valentino Gantz developed a breakthrough technology known as “active genetics,” which results in parents transmitting a genetic trait to most of their offspring (instead of 50 percent receiving the trait under standard inheritance). Immediate targets of active genetics included gene-drive systems for immunizing mosquitoes against vector borne diseases such as malaria. Bier and Gantz also proposed using active genetics for a variety of other potential human health and agricultural benefits. Now, Shannon Xu, together with Gantz and Bier, employ CRISPR/Cas9 to edit gene regulatory elements in their native genomic environments, revealing new fundamental mechanisms that control gene activity, as described Feb. 6 in eLife. The authors also provide experimental validation for using active genetics as an efficient means for targeted gene insertion, or “transgenesis,” and single-step replacement of genetic control elements. “Technical advances enabled by active genetics represent an innovative toolkit to engineer organisms with novel features, thereby enabling a new era of advances in synthetic biology,” said Gantz. “These advances should encourage other researchers to employ active genetics in a broad range of organisms to enable and accelerate their research,” said Xu. “This knowledge may eventually lead to biological design based on first principles. That is, acquiring the knowledge to engineer organisms with specifically designed novel features,” said Bier, professor and recently named holder of the Tata Chancellor’s Endowed Professorship in Cell and Developmental Biology. “Such genetic engineering manipulations should open new avenues of research and animal and plant engineering that are out of reach using current technologies,” the researchers note. These innovative new areas of biological research are in line with the goals of the Paul G. Allen Frontiers Group, which named professor Bier an Allen Distinguished Investigators in 2016. Active genetics is also the technology driving the new Tata Institute for Genetics and Society. Based at UC San Diego and India’s Institute for Stem Biology and Regenerative Medicine, the institute was launched with a mission to advance global science and technology through socially conscious means and develop solutions to some of the world’s most pressing challenges, from public health to agriculture. The research published in eLife was supported by National Institutes of Health (grants 1R01GM117321, 1DP5OD023098 and NS047101), a Paul G. Allen Frontiers Group Distinguished Investigator Award and a gift from Sarah Sandell and Michael Marshall.